Well, it hadn’t been a week since I last showered you with images and descriptions of products in delightfully anachronistic packaging before the emails started coming in. “Ted, won’t you please find more products in delightfully anachronistic packaging to share with us, the readers,” so many of you wrote. Okay, okay, I give in! But you’re just getting one more…for now. And here we are. Despite the little missus’ recent heart attack scare, I can’t keep the salt away from her. I’ve given up trying to let her dole it out via the traditional shaker and just let her pour it onto her Fritos pie right out of the canister. She’s going through a package a week, and at this rate, Morton’s is getting a little pricey. Solution? Royal Crystal Iodized Salt. Picked up this baby at the Dollar Tree for – yes! – a dollar and believe me, brother, you’re not going to find a more delightfully anachronistic package of salt. 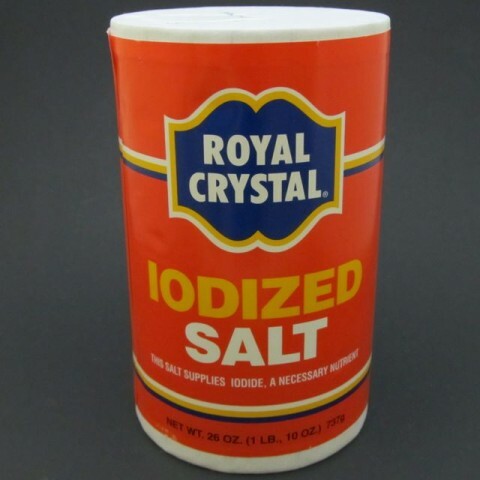 This Royal Crystal Iodized Salt looks like it’s from…the 1970s. Proof of Its Modernity: Mention of trans fat on nutrition label. Where You’d Expect to See It: In the background of a photo in a print ad for Fit & Trim dog food in “Family Circle” from 1979, shot in a grocery store with all the products on the shelves out of focus just enough so you can’t read the brand names. But you’d, eh, recognize it from the color scheme, sure. Buy It Because: For God’s sake, salt is salt. You might as well get the cheap stuff. Hell, I’d feed our six foster kids road salt if we lived in a climate where I could scrape it off the streets in the winter. • A simple design with bold letters on a field of that deep red-orange – that’s what makes this one look old. That and the double-shield thing – I’m sure it has some sort of graphic design name – in which “Royal Crystal” is printed in white on deep blue. That thing alone looks like something you’d see as part of some sort of modern American colonial bicentennial style decorating motif, right? Oh, you know what I’m talking about. Look, the important thing is it looks like the Royal Crystal salt people designed this thing 35 years ago, and here it is, still today. I love it, and now that you’ve seen it, so do you. Posted by Ted on July 22, 2011, 9:00 AM.